JS-3.0 Swinging-Bucket Rotor (Unshielded). Unshielded, six-place rotor with aluminum rotor yoke and removable aluminum swinging buckets. 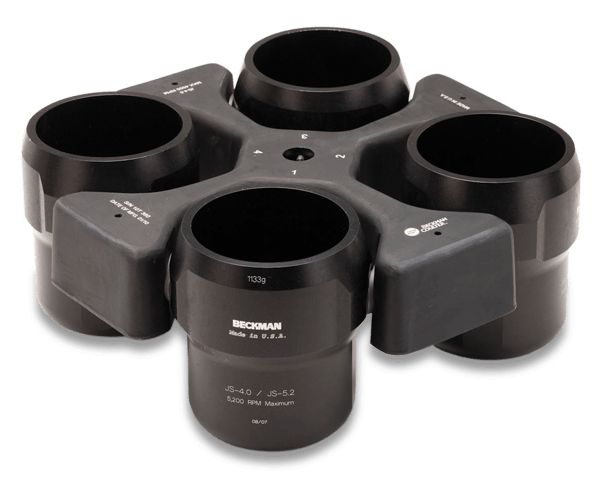 Buckets are interchangeable with Microplate Carriers 358682 for spinning microtiter plates and MiniTube Racks in the JS-3.0 Rotor. Holds up to six liters, six blood bag cups or six microtiter plate carriers. Accepts all Multi-Disc Adapters. Major applications: Rapid sedimentation of protein precipitates, large particles, cells, and cell debris. It can be used for binding studies and separating serum from whole blood. For use in J6 Series centrifuges only.